Today is "International Self-Care Day" and I felt it would be the perfect opportunity to talk about the importance of self-care! We often times say how much we love ourselves and how much we need to care for our own well-being, but we do we actually take the necessary time to act on it? It's so easy to start a new act of self-care, but continuing and creating a habit out of it is the challenge for us all. I'm guilty of this myself y'all! I'll say I'm going to do the things that are considered self-care to me (like a bubble bath, reading a good book, or going for a nice drive), and I will possibly do it once. Then, those things will slowly get replaced with laundry, cooking, cleaning, and all of the others things we have to do in life. I mean, that's adulting for you and the reality for the majority of us! But honestly, when am I supposed to add in that necessary "me time" to my day? Let's make a pact right here on this blog that we will, as a whole, do a much better job of self-care. The easiest excuse is that we don't have enough time, but that's just what I said -- an excuse! Let's stop using it. We prioritize for the things we really want to do. We browse Instagram all day, watch our favorite TV shows (anyone watching So You Think You Can Dance?! ), and other things. Now, everyone's definition of self-care is different. Maybe watching TV is something you do for yourself and if so, then great! The point is to just stay away from the things that make us say we don't have time and get into the things that relieve our stresses. Now, say it with me! "I, (put your name in here), promise to spend more time with myself! I will put myself and my happiness first! I will actively practice self-care every day in every way possible because when I am relaxed and stress free, that makes for a positive and happy environment for myself and for those that I love!" Now, don't you feel better? :) I know I do! I can't wait to start holding up my end of the bargain on this. The key is going to be having effective Time Management. You ever notice how time ticks by so slowly when you're doing something you don't necessarily want to do, but then when you're scrolling social media or having fun, time moves SO FAST? I can't tell you how many times I said I was only going to be on Instagram for 20 minutes or so, and then looked up and saw a hour had passed! That is such a waste of precious time. Is it a bubble bath? Is it going shopping? Is it just sitting in silence and meditating? Whatever self-care may be for you, identify it. This looks different for everyone, so what works for your significant other or friend might not be the effective method for yourself. Even if this isn't something you identified as a distraction, let me ask you something. When was the last time you felt more relaxed or at ease after browsing social media? For me, if anything, I feel more stressed with every crazy thing going on in this world! Take a step away for a little while and see what happens. This is going to be hard for me, but I'm going to do it! Get out the house and hang out with the people you love most! Any time I'm stressed or unhappy, when I get to spend time with those I love, I always feel so much better. This is a major form of self-care for me. People I love help me through tough situations all the time without even knowing it. Now that you've figured out what self-care is for you, and you've identified why you don't get enough of it, start scheduling it into your day. Maybe start with one or two days per week and then eventually work your way up to having some sort of self-care every single day. Maybe wake up in the morning and do something for yourself, or wait until the night time before bed. Find what works for you and watch your life change for the better. I hope reading this post has inspired you to make self-care a priority in your life. I know it can be so hard, but we have to do it. Putting your needs before your spouses, your kids, your family, and friends can seem like an impossible task or even selfish, but IT'S NOT and IT'S OKAY. What can you give up in order to devote at least 10 minutes of your day to self-care? Remember, practicing self-care fuels your mind, body, and soul. Your mental, physical, and emotional well-being will thank you! I just want you all to function at your highest potential and live life to the absolute fullest. How have you made self-care a priority in your life? Comment below and let me know! I recently realized just how important self-care it. I was running myself into the ground by not sleeping, eating, and only drinking coffee! bringing balance into my life has made such a positive differnce! This is SUCH a great reminder! Social media breaks are crucial every once in awhile. Self care is SO important - especially nowadays with social media!! I'm actually pretty good about it, I love to workout, do face masks, and take phone breaks. I always feel so refreshed after! This is such a great post! Self care really is so important and can lead to a more relaxed life. Thanks for sharing these tips. 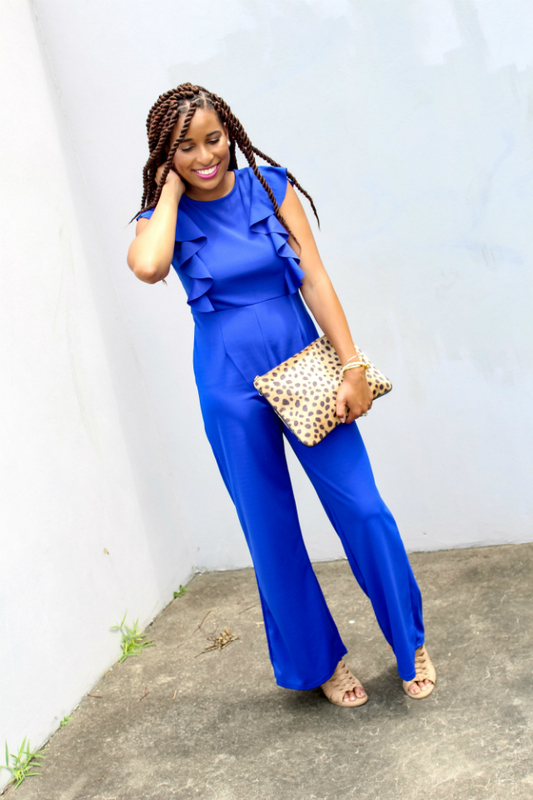 Absolutely LOVE this jumpsuit! And agree, social media breaks are crucial. I did a full week one a couple months ago and it was AMAZING! Love this post and your tips on finding time to practice self-care! I love taking time away from social media to just CHILL. I used to get to guilty when I practiced self care. Now I realize that it's much needed for my sanity! Great tips girl! I love this!! I like to put the phone away and do yoga. & love your jumpsuit, so cute! These are all amazing tips! I definitely put my phone down and on silent when I'm in my self care mode. I love the idea of scheduling it! YES!! I definitely need to make more time for self care. #2 really made me think about my priorities and why I'm putting my self care so low on the list .. but no more excuses! First of all I LOVE this blue on you! I love the message you're spreading here! 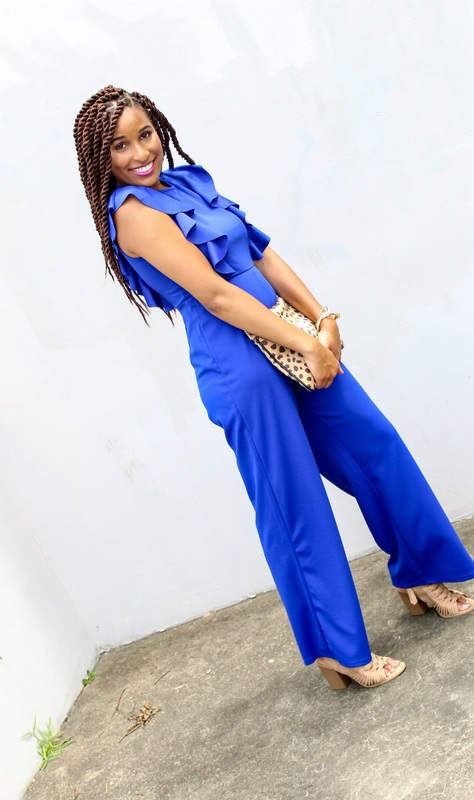 I'm in LOVE with this jumpsuit!! The silhouette looks beautiful on you and the color is to-die-for! You look amazing!! Also-love what you are saying about self-care. It's so important!! Great post!! 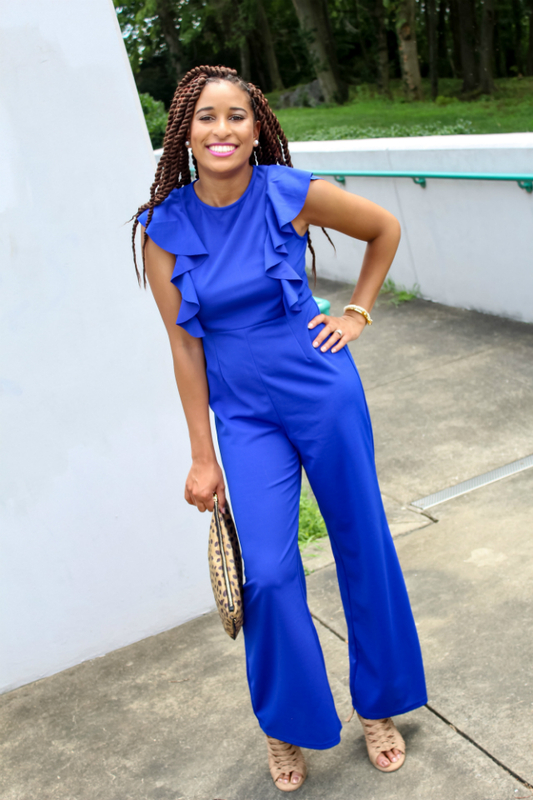 I love this blue jumpsuit on you and there are some great tips here. Thanks for the suggestions! 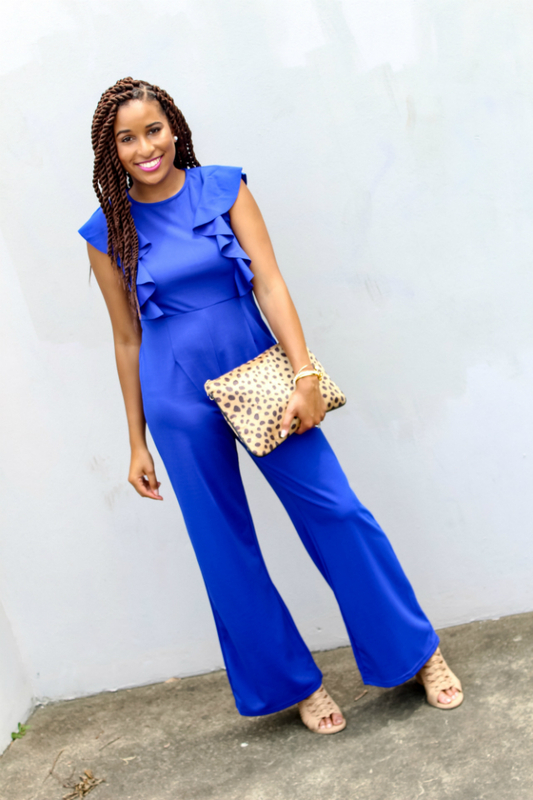 LOVE this jumpsuit!! This color is incredible!! This is such an important thing to share! Self care is more important than we realize, I’m sad I missed self-care day! Marking it in my calendar for next year! Self-care is definitely important, my favorite things to do are put on a mask, take a bath and just relax. I need to take more social media breaks, though! This is such a great and important post! I wish more people realized that self care needs to be a part of our DAILY lives and not just times we are stressed out or having a bad day. My self care has been going to yoga or getting a massage once a month. Self care is so so important! Okay first off, this color is my FAVORITE. I love how you styled it with a leopard print bag because I love leopard print bags lol So cute. Great tips! I can be hit or miss with practicing self care, but your post inspired me to be more consistent. These are great tips for practicing self care! PS I love your jumpsuit. The color looks amazing on you!